Renault produces Logans for Russia at its plant in Moscow (shown). With one month to go, the Renault Logan has pulled ahead of the Ford Focus to become Russia's top-selling foreign car. The low-cost Logan outsold the Focus 5,131 to 3,348 in November. The Logan's sales surge pushed it into the top 3 in Russia's overall new-car sales, a spot in the table usually dominated by the Lada Priora, Samara, and 2105/2107 from Russia's No. 1 automaker AvtoVAZ. 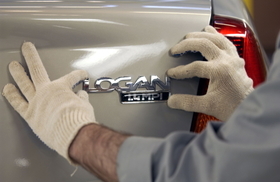 In October, the Logan beat the Focus 5,076 units to 3,677 to pull within 548 units of the lead. Ford's Russia boss doesn't think that the Focus' sales decline has anything to do with the quality of the product. "The financial crisis has resulted in a shift in the market to the budget brands offering significantly lower levels of ride, handling and comfort and with fewer safety options." Nigel Brackenbury, Ford of Russia president, said in an e-mail reply to questions. The Logan starts at 299,000 rubles (6,785 euros/$9,946) while the Focus starts at 497,100 rubles (11,280 euros/$16,535). He added that despite the shift, the Focus has increased its market share in the compact segment to 3.8 percent through November, up 0.3 percentage points on a year ago, which is in line with the automaker's plans. The Logan has great potential to increase its lead over the Focus next year. Renault will double production at its Moscow plant to 160,000 units in 2010. The expansion will allow Renault to add the Logan's hatchback sibling, the Sandero, to the plant and create enough room to add the Duster low-cost SUV in late 2011 or early 2012. Russia vehicle sales by manufacturer, Nov. & 11 mos.